“Never put your eggs all in one basket.” How many times have you heard that expression? As a former teacher, this is how I view educational methods. My children are too precious to trust their brains to any one teacher, curriculum, or program. This is especially true for my child with dyslexia. If you are a parent of a dyslexic child you’ve probably heard promises before. “Spend $20,000 at our institute and your son will be on grade level!” Or what about that mom in your book club who says, “I heard cranial manipulation can solve dyslexia. Have you found a massage practitioner?” Yikes! 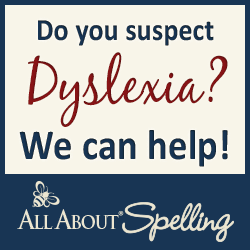 When you are trying to get help for your child with dyslexia it’s hard to know what to do. My guiding principal is to spend time and money on evidence-based solutions my family can afford. That means no, we will not refinance the house to pay for private dyslexia school, but yes, we will forgo family vacations so we can pay for two hours a week of tutoring with a certified Orton Gillingham and Wired for Reading teacher. No, we will not waste money on some crack-pot theory. Yes, we will flood our child with audio books via our subscription to Learning Ally. But what if all that support still isn’t enough? I’m a credentialed teacher, but a lot of the teaching methods I tried with my dyslexic child were not very effective. However, whenever I brought out the All About Spelling and All About Reading materials, they seemed to make a difference. Once I started researching dyslexia I realized why. Marie Rippel is an expert on dyslexia! She’s a member of the International Dyslexia Association, and incorporates a lot of the Orton Gillingham approach into her curriculum. “Okay, great,” I thought. “All About Learning Press is helping my child but I have no idea how to fit this into our busy lives. We are not homeschoolers. I’m not going to start homeschooling anytime soon, so don’t even suggest it.” Instead of radical life changes, I went for easy modifications instead. #1: Read the Teacher’s Manual cover to cover and then give yourself permission not to follow it exactly. What makes All About Reading a fool-proof homeschooling program is that it’s scripted. Marie tells you exactly what to say, word for word. Follow her instructions and you won’t screw up. But my kids are already in school all day. When they come home we have Girl Scouts, Boy Scouts, gymnastics, ballet, guitar lessons, and dyslexia tutoring, depending on what day it is. Plus they need to do stuff like eat dinner, walk the poodle, and play. When I first started incorporating All About Reading into our schedule, I tried to follow the Level 1 manual exactly, just like I do with All About Spelling over the summer. But there was never enough time to finish a lesson, and it was hard to be consistent without stressing the whole family out. So I decided to go off script, and that’s when it became a heck of a lot easier to turn a homeschooling curriculum into something practical for afterschooling. #2: Smoosh All About Reading into your child’s bedtime rituals. We read at bedtime no matter what. Generally we have a fun chapter book going, like the “Cupcake Girls.” (Do those girls ever pay taxes? I’ve never been able to figure that one out.) Before we get to the read aloud, we do kid-reading first. There are two possible choices: the primer book or flashcards. #3: Repetition is your friend, and stickers make repetition fun. Every time my child reads one of the short stories, a new sticker pops up in the table of contents. This helps us keep track of progress. We try not to read the same story two nights in a row so that memorization doesn’t remove the need for phonics. When the entire book is finished there is a major reward like a new toy. Astute All About Reading veterans will probably wonder, “How do you know what lesson you are on in the teaching manual?” The answer is I don’t. Shock! Gasp! Horror! I can kind-of tell from the flashcards, but I don’t pay that much attention. What I’ve discovered is that the All About Reading materials are so well crafted, that my child can’t progress through the flashcards unless she’s ready. She can’t move up in the short stories unless she’s capable. The two components work together to keep her at the right pace. #4 Prep the workbook activities and store them in your purse. My purse is a giant mess of fluency worksheets, flip books, and other scraps of paper I intend to work on that week. We squeeze out time when we can. Waiting during the guitar lesson. Waiting in the car to pick a sibling up. Waiting in line at Costco. If we have five minutes to spare, then we work those five minutes. For our situation, this means I also have to have a set of my kid’s reading glasses in my purse. I actually bought a cheap pair on Zenni for this exact purpose. Do we try to do the activities that correspond with the stories and flashcards? Yes. Sort-of. I do the best I can to be consistent, but I give myself permission to not be perfect. #5 Don’t forget about the spelling board! 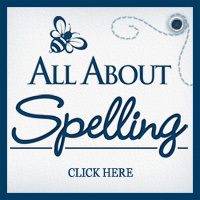 I am such a horrible speller (with a potentially undiagnosed spelling learning disability) that there’s no way I would risk going off scrip when it comes to All About Spelling. I keep that teacher’s manual right by our white board. The trick is fitting in spelling lessons each week. Generally we save these for the weekends. Summer is when we hit All About Spelling hard. Whenever I feel like I’m failing as an Afterschooling mom, I remember that in summer we’ll rack up major learning hours when other families are watching TV. #6 Bring out the big bucks because bribery works! The best way I’ve found to keep our schedule chugging along is by posting a new bingo board on the wall every week. Complete a row and earn a prize, it’s that simple. Notice how our bingo chart mixes in All About Learning Press materials with the Handwriting Without Tears App, Learning Ally audio books, Dreambox Math, and Nessy. Margaret the tutor is also on the chart! This is a reflection of my guiding principle, don’t put all my trust in any one solution. All About Learning Press is wonderful and I love it so much I’ve been an affiliate for years, but it’s not the only method I’m using to seek help for my child. Conclusion: Is All About Reading making a difference? I’ve been saying “my child” instead of “my son” or “my daughter” because over the years I’ve become more conservative about what I reveal publicly about my children. I write a weekly newspaper column so I need to be extra careful about their privacy. But…I have some pretty astonishing before and after pictures of writing samples I could share, as well as Dibels results, and sight words assessments. My child is at grade level and does well at school. My child is achieving so much that the school district will not offer any special education services, only a 504 plan for disability. All of this success is directly related to help that happens afterschool. Grandparents are also noticing a huge difference. Last summer they listened to my child painfully read from “Run, Bug, Run.” Now “What Am I?” is a comfortable reading level. That’s flippin’ awesome! Finally, my child’s confidence is huge, and that’s a worth that is difficult to measure but the foundation for a happy life. Believe and achieve. As I mentioned before I am an All About Learning Press affiliate, but I didn’t share any of this out of a desire to earn money. I typed it up because I know how scary it is when you desperately want to help your child overcome dyslexia, and you don’t even know where to start. If you’d like more information about the specifics of my Afterschooling plan, please click here. 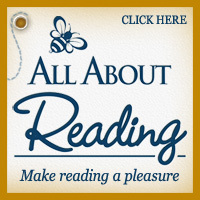 To find out more about All About Reading or All About Spelling, click on the links below. By Jennifer Bardsley in Afterschooling, Dyslexia on March 7, 2016 . I recently purchased the AAR level 1 for my kindergartener. I did this because she was falling behind her peers in the fall and I was not pleased with the approach the school takes to teach reading—they use balanced literacy. I also have a sneaking suspicion that she is dyslexic but the local testing facilities doesn’t test until half way through 1st grade. The material does seem overwhelming especially since I plan on using it as after-schooling help. But, my fear is that I will confuse her even more. At home we are working out sounding out words. But At school she is on leveled reading (A-B), which included words that are not decodable. So she tries to sound out words at school that we are have not yet learned phonetically (and are not even taught in AAR until levels 2-3). Have you experiences this concern? Is your child in half day Kindergarten or full day? My daughter was in half day, so I was able to use the afternoon to Afterschool. But if your kiddo is in full day, I would suggest spending twenty minutes, three times a week, using the AAR materials and trying to make it as fun as possible. Think hands on. So the letter tiles, the games, cuddled up and reading the Blue book together. Not flashcards. I’d also go back to the Kindergarten teacher and use vocab from Balanced Literacy. Say that your child needs more time with Working With Words. Explain that Word Walls are not a good strategy for children who might have dyslexia, because working memory issues makes it difficult to hold words in your head. If local testing facilities won’t test, see if your insurance provider will pay for a neurospych exam from a psychologist. In my area these run about $2,500. There can be a 4-12 month waiting list (where I live) for a child to be tested. I put my daughter on the wait list in Kindergarten, and she was tested at the beginning of first grade. We ended up paying out of pocket for the assessment. In the meantime, she still made progress with the Afterschool things I mentioned, including AAR, but once we got that official Dyslexia diagnosis we also began twice a week tutoring with a teacher trained in the Orton Gillingham method. Good luck! Please let me know if there is anything else I can do to help.